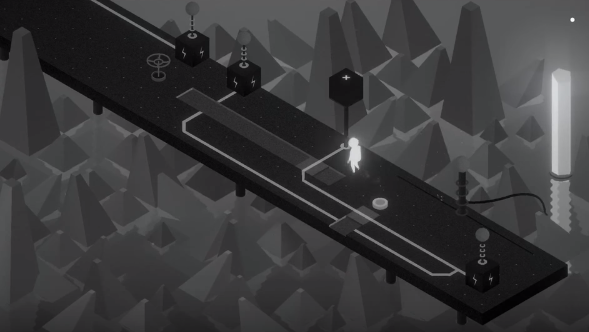 Starman: Tale of Light by nada studio walkthrough, cheats, solutions for iOS and Android devices. 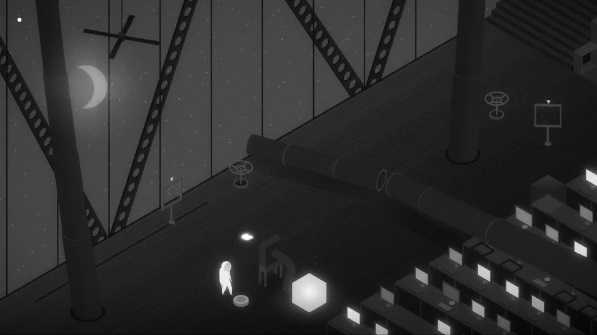 Starman: Tale of Light is a gorgeous looking puzzle game with a delicate atmosphere and some well designed puzzles. Your task is to recover the light and bring it back. If you find it difficult to solve some of the puzzles I'll walk you through them, step by step. I will try to keep the guide brief, if you still need help to pass a level just leave a comment and I'll give you more details there. Tap on the white cube to pick it up than bring it to the lighting slot on the right side. The door will open and you can walk to the next area. Here you have to move the black cube and fill the gap on the road. Now just use the switch on the wall to open the door. In this room you'll find a transparent cube. Pick it up an hold it in front of the white light, this will make the cube white. Now place the white cube on top of the black cube to charge it and complete Chapter 1. Start by pulling the lever that opens the door, than go in the next room. First move the transparent cube away, than take the black cube and place it on the slot in front of the white light. Now place the transparent cube on top of the black cube, than make the character stand on the circle button (top side). This will lift the transparent cube into the light. Now place the white cube on the lightning slot and go down the stairs. Start by placing the black cube on the circle button. Now use the switch on the wall to lower the lift. Move the black cube away, and use the switch again to bring the lift up. Climb up the ladder and place the transparent cube on the lift. Bring the lift down, take the transparent cube and light it up, than place it on the lighting slot to finish this area. Use the rotating button to open the path below. Go down and take the transparent cube and go back up with it and light it up. Now you will have to avoid going through the vertical lights with the white cube (this will power down the white cube). So to get the white cube down you have to place it on the moving platform, than use the rotating button to lower the ramp half way and make the white cube slide down. 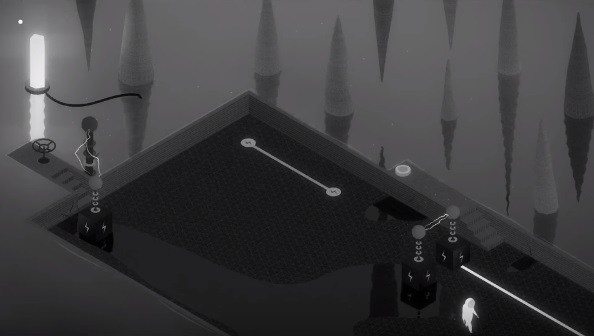 You'll have to use those levers in the right order to solve this puzzle. Start with the bottom left lever. Take the black cube and place it anywhere. Now use the top left lever to bring up the round button. Place the black box on the round button, than use the top right lever. Move the transparent cube away and switch the bottom right lever to bring up the light. Light up the transparent cube and go, with the cube, to the next area. Place the white cube on the lightning slot and rotate the wheel to open the door. Go up the stairs, take the transparent cube and bring it down, light it up, than place it on the middle black cube (3 cubes on the left). Now light up the second transparent cube, light it up and place it back where it was. Now take the two black cubes (on the right) and bring the up the stairs. Than move the first white cube on the third black cube. Now go up the walkway, to the next area (also take the white cube you'll find along the way). Start with the left wheel to move the block outside. Now use the middle wheel to lift the block all the way up. Place the white cube on the block and lower it back down using the middle wheel. Now use the the left wheel to get the block inside. Now the tricky part comes, use the right wheel to gently push the white cube towards the edge (be careful not to drop it). Finally use the left wheel to slide the block under the cube and it will fall down in it's place. Start by crossing the black cube on the other side, using the switch on the wall. Than take the transparent cube, light it up, and place it on the circle button. Now bring back the black cube, and place it on the white platform. Stand with the character on the white platform and grab the white cube. You should now be on the other side with both cubes. 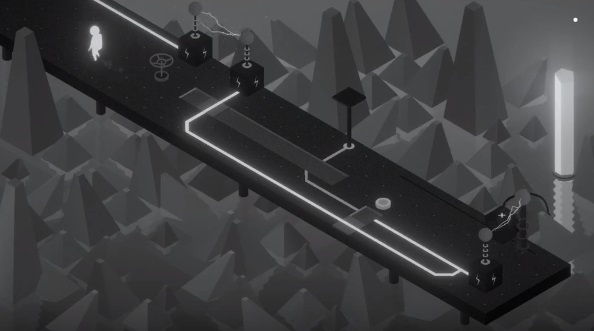 Now the trick to crossing the white cube over the vertical lasers, is to first place the black cube on the lasers that put the white cube on the black cube. Than simply go to the other side, grab the white cube and put it on the lighting slot. Than use the two wheel buttons to point the laser on the circle dot, to open the door. In the "Dam" room start by placing the black cube up on the conveyor. Than put the transparent cube on the circle button. Now use the wheel to slide the black cube all the way to the left, than bring it back until the pendulum aligns with the laser. Now light up the transparent cube and place it on the lighting slot, in the previous room. In the final room you need to change the direction of the conveyors, until you can get the white cube on the lightning slot. Is a bit tricky this one but you should be able to beat it with a bit of patience. 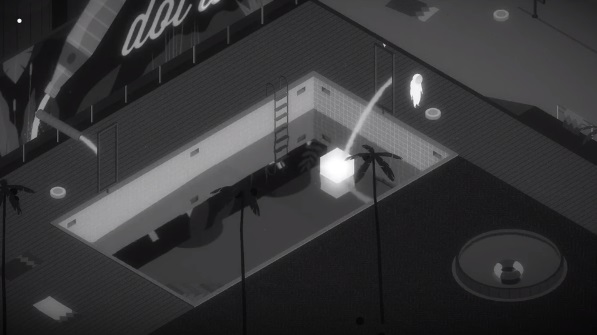 After you do it, light up the transparent cube and bring it back in the previous room to complete Chapter 4. Use the bottom wheel to align the transparent cube, on the generator, with the steam pipe. Climb up the ladder and close the steam pipe on the right. This will push the transparent cube down. Now use the switch on the generator to raise up the fan. Align the fan with the second steam pipe, the steam will spin the fan and this will generate the light beam needed to light up the cube. On the dock turn on both steam pipes, than put the black cube on the steam jet. Climb up the small ladder and place the black cube on the button. Now you can climb all the way up to use the white cube. On the upper level just turn on the steam pipe until you knock off the weight, this will lower the stairs. Go up the stairs, turn on the other steam pipe than place white cube on the edge and use the switch on the wall to push it towards the lightning slot. This will power up the magnet machine on the top floor. Now use the 4 buttons to grab the white cube, with the magnet, and drop it on the lightning slot to finish Chapter 5. Start on the right side by tilting the balls platform so that the ball will fall and spin the mill. After a few successful hits you should be able to get the black cube. Take it and go to the next area. Now place one of the cubes on the button and one next to the hammer. Lift the hammer a bit and let it fall down, this will activate the magnet in the hammer and pull the black cube. Now lift the hammer, all the way up, and release it to launch the black ball. This will drop the white cube. Take the white cube and place it on the lightning slot, in the first area. Now simply step on the "Star Count" button and the white cube will be lowered. For the bottom right side. Start by placing the 3 black cubes on the round lightning signs. You have to use those electricity poles to fill the "gaps" on the line connecting the cubes. To get the top cube make them like this, than to direct the power to the main room put them like this. For top right side. Lift the black cube a bit, so the ball will hit it. Now use the square-circle button to swing the ball until the glass breaks. Take the black cube an place it on the same button you used before. For the left side. Start by pushing the white button until the floor is covered in water, than you can use the water to conduct the electricity to the main room. Make them like this. Now go to the main room and use the 2 wheels to align symbols on the cylinder. Start by placing the white cube on the lightning slot than the transparent cube next to the top desk. Than use the 2 wheels to align the portals with the white cube and the transparent cube. See this image for visual representation. The first puzzle requires good timing. Use the right circle button to bring the two cubes to the right side. Now go press the left circle button, than press the white button, at the right moment, to hit the transparent cube with the light. 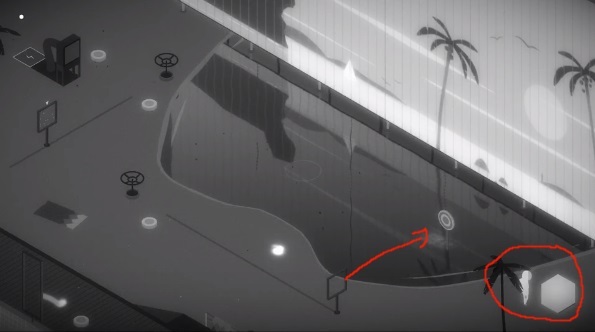 For the pool level you need to spin the portals and redirect the water flow away from the pool. Now go down in the pool and place the white cube in front of the right portal. Now redirect the water back into the pool. The water jet will push the cube. 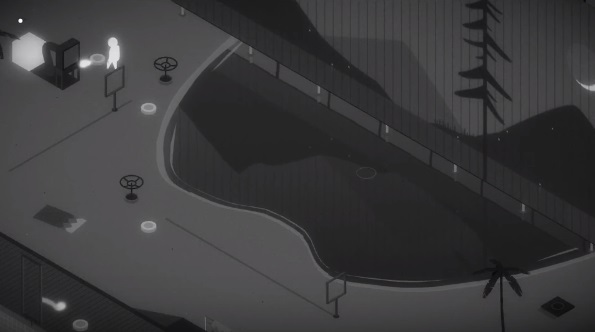 Now empty the pool again and get the white cube, and move to the next area. First place the white cube on the lighting slot, than move the portals like this and press the top right button to launch the light beam. Now you'll notice the light beam moves pretty slow. This gives you time to move the left portal in it's path and create an infinite loop. Now you'll have enough time to move the white cube on the right side button and bring up the target. Than simply spin the left portal to redirect the beam and hit the target. See this image for visual representation. Slide open the box with the black cube. Than use the lever (top right) to lift everything up. Now go and close the cover of the black box, before the levitation ends. Place the black box on the circle button, and use the levitating lever again. This time go stand on the small platform on the top left corner, before levitation end. Wordscapes 2 by "PeopleFun" answers, cheats, solutions for the levels in [Fog] River Pack. On this page you'll find the solutions for all the levels in River Pack. Leave a comment if some of them are wrong and I will fix it as soon as possible. Wordscapes [Fog] River Pack Answers, Cheats, Solutions for Android, iPhone, iPad, iPod. Wordscapes 2 by "PeopleFun" answers, cheats, solutions for the levels in [Fog] Range Pack. On this page you'll find the solutions for all the levels in Range Pack. Leave a comment if some of them are wrong and I will fix it as soon as possible. Wordscapes [Fog] Range Pack Answers, Cheats, Solutions for Android, iPhone, iPad, iPod. Wordscapes 2 by "PeopleFun" answers, cheats, solutions for the levels in [Fog] Lake Pack. On this page you'll find the solutions for all the levels in Lake Pack. Leave a comment if some of them are wrong and I will fix it as soon as possible. Wordscapes [Fog] Lake Pack Answers, Cheats, Solutions for Android, iPhone, iPad, iPod. Wordscapes 2 by "PeopleFun" answers, cheats, solutions for the levels in [Fog] Valley Pack. On this page you'll find the solutions for all the levels in Valley Pack. Leave a comment if some of them are wrong and I will fix it as soon as possible. Wordscapes [Fog] Valley Pack Answers, Cheats, Solutions for Android, iPhone, iPad, iPod. Wordscapes 2 by "PeopleFun" answers, cheats, solutions for the levels in [Fog] Wood Pack. On this page you'll find the solutions for all the levels in Wood Pack. Leave a comment if some of them are wrong and I will fix it as soon as possible. Wordscapes [Fog] Wood Pack Answers, Cheats, Solutions for Android, iPhone, iPad, iPod. Wordscapes 2 by "PeopleFun" answers, cheats, solutions for the levels in [Beach] Pebble Pack. On this page you'll find the solutions for all the levels in Pebble Pack. Leave a comment if some of them are wrong and I will fix it as soon as possible. Wordscapes [Beach] Pebble Pack Answers, Cheats, Solutions for Android, iPhone, iPad, iPod. Wordscapes 2 by "PeopleFun" answers, cheats, solutions for the levels in [Beach] Wash Pack. On this page you'll find the solutions for all the levels in Wash Pack. Leave a comment if some of them are wrong and I will fix it as soon as possible. Wordscapes [Beach] Wash Pack Answers, Cheats, Solutions for Android, iPhone, iPad, iPod. Wordscapes 2 by "PeopleFun" answers, cheats, solutions for the levels in [Beach] Shell Pack. On this page you'll find the solutions for all the levels in Shell Pack. Leave a comment if some of them are wrong and I will fix it as soon as possible. Wordscapes [Beach] Shell Pack Answers, Cheats, Solutions for Android, iPhone, iPad, iPod. 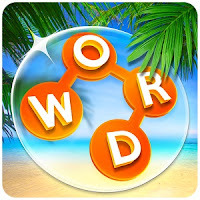 Wordscapes 2 by "PeopleFun" answers, cheats, solutions for the levels in [Beach] Fresh Pack. On this page you'll find the solutions for all the levels in Fresh Pack. Leave a comment if some of them are wrong and I will fix it as soon as possible. Wordscapes [Beach] Fresh Pack Answers, Cheats, Solutions for Android, iPhone, iPad, iPod. Wordscapes 2 by "PeopleFun" answers, cheats, solutions for the levels in [Cliff] View Pack. On this page you'll find the solutions for all the levels in View Pack. Leave a comment if some of them are wrong and I will fix it as soon as possible. Wordscapes [Cliff] View Pack Answers, Cheats, Solutions for Android, iPhone, iPad, iPod. Wordscapes 2 by "PeopleFun" answers, cheats, solutions for the levels in [Cliff] Brood Pack. On this page you'll find the solutions for all the levels in Brood Pack. Leave a comment if some of them are wrong and I will fix it as soon as possible. Wordscapes [Cliff] Brood Pack Answers, Cheats, Solutions for Android, iPhone, iPad, iPod. Wordscapes 2 by "PeopleFun" answers, cheats, solutions for the levels in [Cliff] Dawn Pack. On this page you'll find the solutions for all the levels in Dawn Pack. Leave a comment if some of them are wrong and I will fix it as soon as possible. Wordscapes [Cliff] Dawn Pack Answers, Cheats, Solutions for Android, iPhone, iPad, iPod. Wordscapes 2 by "PeopleFun" answers, cheats, solutions for the levels in [Cliff] Bright Pack. On this page you'll find the solutions for all the levels in Bright Pack. Leave a comment if some of them are wrong and I will fix it as soon as possible. Wordscapes [Cliff] Bright Pack Answers, Cheats, Solutions for Android, iPhone, iPad, iPod. Wordscapes 2 by "PeopleFun" answers, cheats, solutions for the levels in [Cliff] Mist Pack. On this page you'll find the solutions for all the levels in Mist Pack. Leave a comment if some of them are wrong and I will fix it as soon as possible. Wordscapes [Cliff] Mist Pack Answers, Cheats, Solutions for Android, iPhone, iPad, iPod. Wordscapes 2 by "PeopleFun" answers, cheats, solutions for the levels in [Vista] Arrive Pack. On this page you'll find the solutions for all the levels in Arrive Pack. Leave a comment if some of them are wrong and I will fix it as soon as possible. Wordscapes [Vista] Arrive Pack Answers, Cheats, Solutions for Android, iPhone, iPad, iPod. Wordscapes 2 by "PeopleFun" answers, cheats, solutions for the levels in [Vista] Below Pack. On this page you'll find the solutions for all the levels in Below Pack. Leave a comment if some of them are wrong and I will fix it as soon as possible. Wordscapes [Vista] Below Pack Answers, Cheats, Solutions for Android, iPhone, iPad, iPod. Wordscapes 2 by "PeopleFun" answers, cheats, solutions for the levels in [Vista] Fall Pack. On this page you'll find the solutions for all the levels in Fall Pack. Leave a comment if some of them are wrong and I will fix it as soon as possible. Wordscapes [Vista] Fall Pack Answers, Cheats, Solutions for Android, iPhone, iPad, iPod. Wordscapes 2 by "PeopleFun" answers, cheats, solutions for the levels in [Vista] Above Pack. On this page you'll find the solutions for all the levels in Above Pack. Leave a comment if some of them are wrong and I will fix it as soon as possible. Wordscapes [Vista] Above Pack Answers, Cheats, Solutions for Android, iPhone, iPad, iPod. Wordscapes 2 by "PeopleFun" answers, cheats, solutions for the levels in [Vista] Climb Pack. On this page you'll find the solutions for all the levels in Climb Pack. Leave a comment if some of them are wrong and I will fix it as soon as possible. Wordscapes [Vista] Climb Pack Answers, Cheats, Solutions for Android, iPhone, iPad, iPod. Wordscapes 2 by "PeopleFun" answers, cheats, solutions for the levels in [Lake] Grace Pack. On this page you'll find the solutions for all the levels in Grace Pack. Leave a comment if some of them are wrong and I will fix it as soon as possible. Wordscapes [Lake] Grace Pack Answers, Cheats, Solutions for Android, iPhone, iPad, iPod. Wordscapes 2 by "PeopleFun" answers, cheats, solutions for the levels in [Lake] Air Pack. On this page you'll find the solutions for all the levels in Air Pack. Leave a comment if some of them are wrong and I will fix it as soon as possible. Wordscapes [Lake] Air Pack Answers, Cheats, Solutions for Android, iPhone, iPad, iPod. Wordscapes 2 by "PeopleFun" answers, cheats, solutions for the levels in [Lake] Serene Pack. On this page you'll find the solutions for all the levels in Serene Pack. Leave a comment if some of them are wrong and I will fix it as soon as possible. Wordscapes [Lake] Serene Pack Answers, Cheats, Solutions for Android, iPhone, iPad, iPod. Wordscapes 2 by "PeopleFun" answers, cheats, solutions for the levels in [Lake] Set Pack. On this page you'll find the solutions for all the levels in Set Pack. Leave a comment if some of them are wrong and I will fix it as soon as possible. Wordscapes [Lake] Set Pack Answers, Cheats, Solutions for Android, iPhone, iPad, iPod. Wordscapes 2 by "PeopleFun" answers, cheats, solutions for the levels in [Lake] Calm Pack. On this page you'll find the solutions for all the levels in Calm Pack. Leave a comment if some of them are wrong and I will fix it as soon as possible. Wordscapes [Lake] Calm Pack Answers, Cheats, Solutions for Android, iPhone, iPad, iPod. Wordscapes 2 by "PeopleFun" answers, cheats, solutions for the levels in [Field] Amber Pack. On this page you'll find the solutions for all the levels in Amber Pack. Leave a comment if some of them are wrong and I will fix it as soon as possible. Wordscapes [Field] Amber Pack Answers, Cheats, Solutions for Android, iPhone, iPad, iPod.